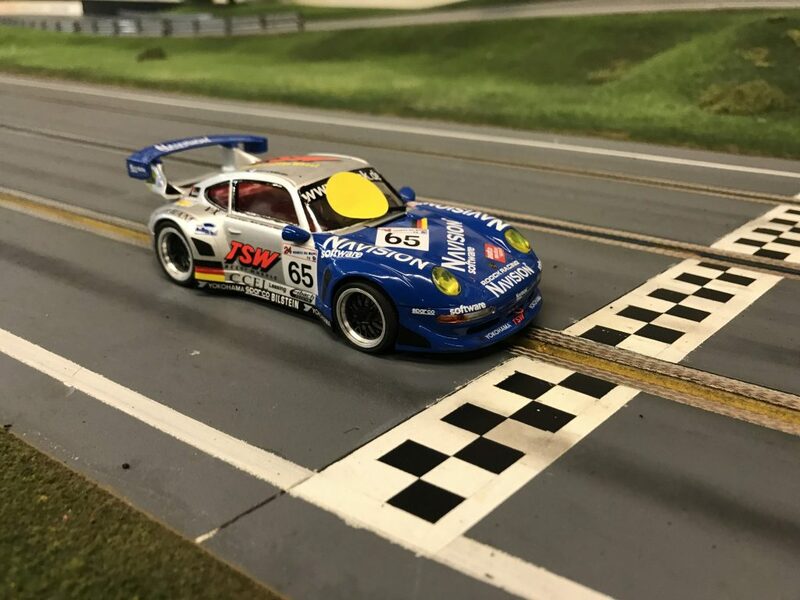 The second round of the Austin Slot Car Clubs RevoSlot Porsche GT2 race was very different than the first round of the series as all racers had time to work on their cars and get them rebuilt to be within the dimensions listed in the rules. This round should see closer racing than we had in the first round. 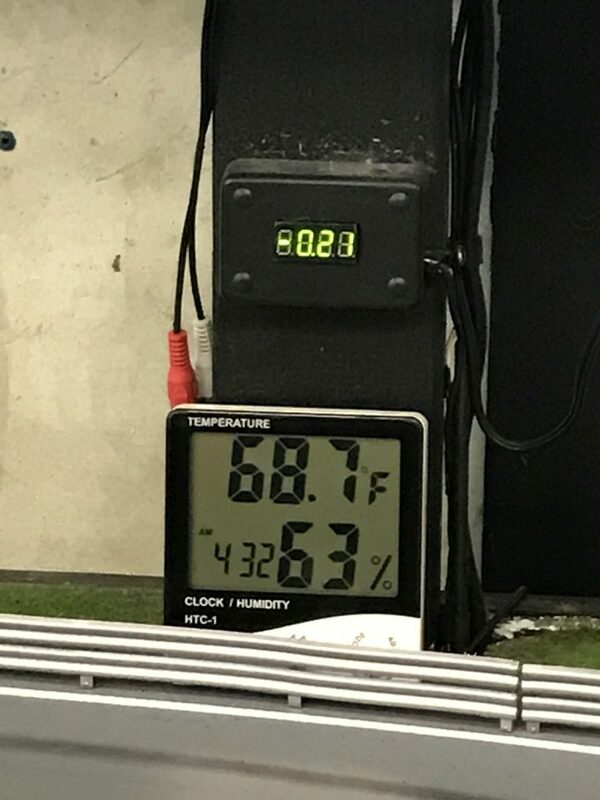 The track was in great shape with the track temp at 71 degrees while the track room itself was very comfortable at 68.7 degrees. Humidity was a little on the high side at 63% but overall it was great conditions for a race. Pre-race tech went much better for this race. 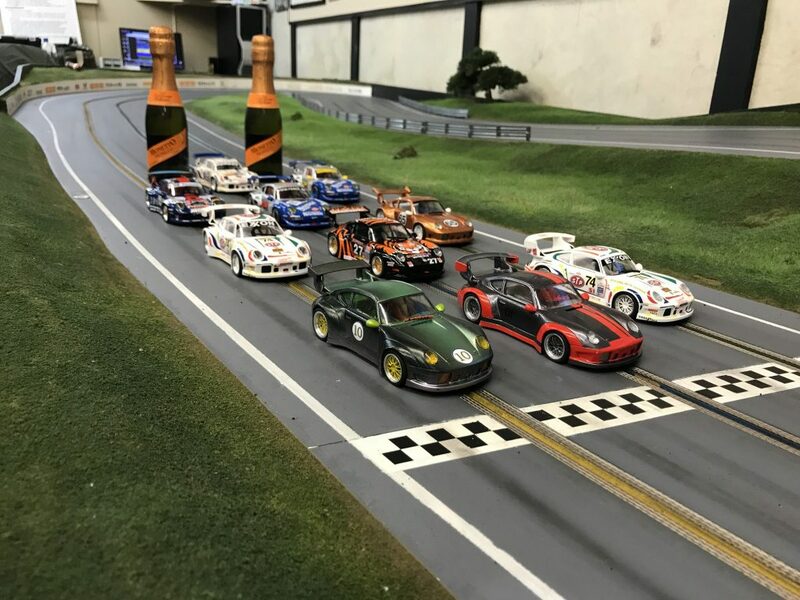 There were eleven racers present for this round of the series and all had cars that were well prepared and were within the limits of the rules. 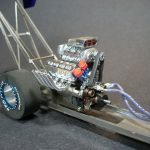 Guide wires glued or taped down so they don’t come in contact with the front axle and protentionally slow the car down. Some cars had axles that moved freely within the bearings while others had more friction and did not spin freely. Some cars had tires that just met the rules and looked rather worn out while others were practically new and had little if any wear. Some cars were super clean while other were very dirty with tire crumbs all over the body and the car. 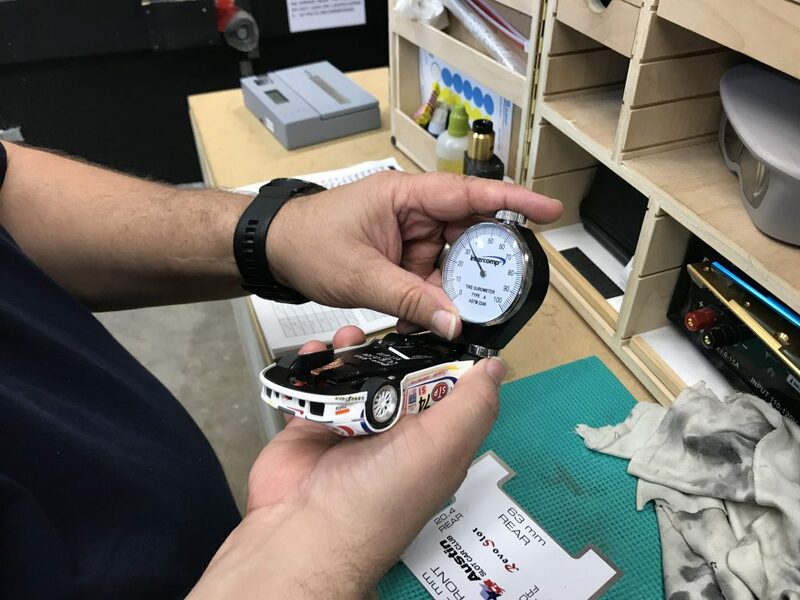 The pre-race tech for this series takes slightly longer as every part of the car is reviewed and checked to make sure it is within the rules. The goal is to make the racing as close as possible and as fair as possible. One of the measurements focused on in pre-race tech was the tire diameter on both front and rear tires on cars that were close to the legal limit. 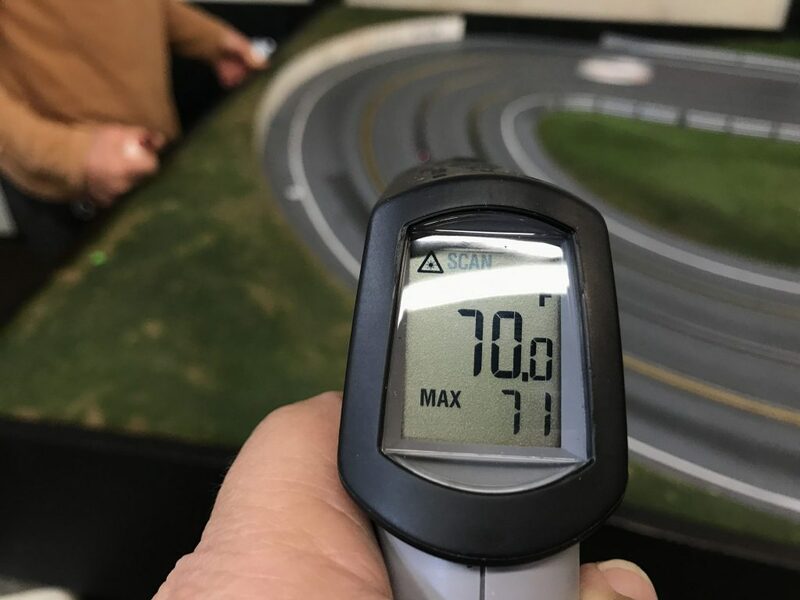 The goal here was to measure the wear on the tires and get some idea of what tire wear would be like for cars running three 5 minute heats. 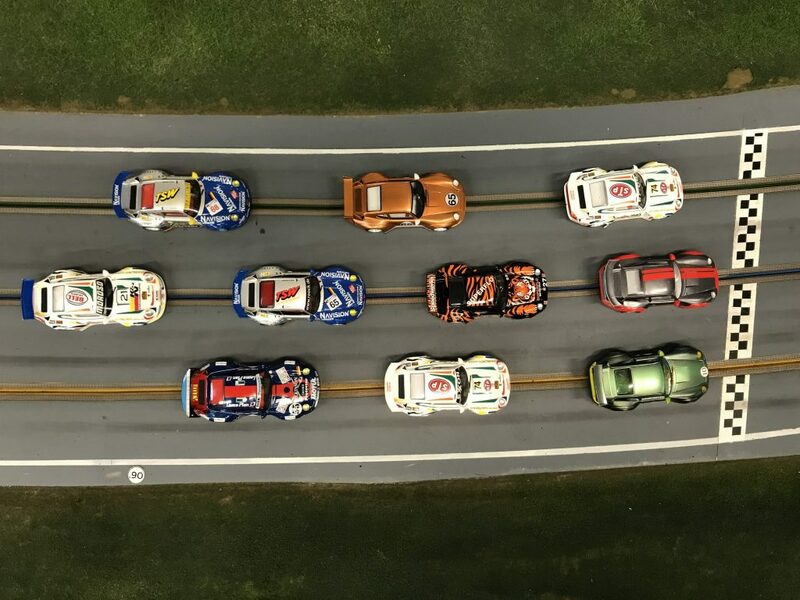 The first race had some good racing, but it was not as close as I thought it was going to be for this being a spec series. There were some cars that were outside the rules and once corrected I believed the racing in the second race would be much closer. I was right. The results showed that this was a close race with the last racer being within 8% of the winner’s lap total. This result shows this race to be one of the closest races since the club was formed 8 years ago. Quite a feat. 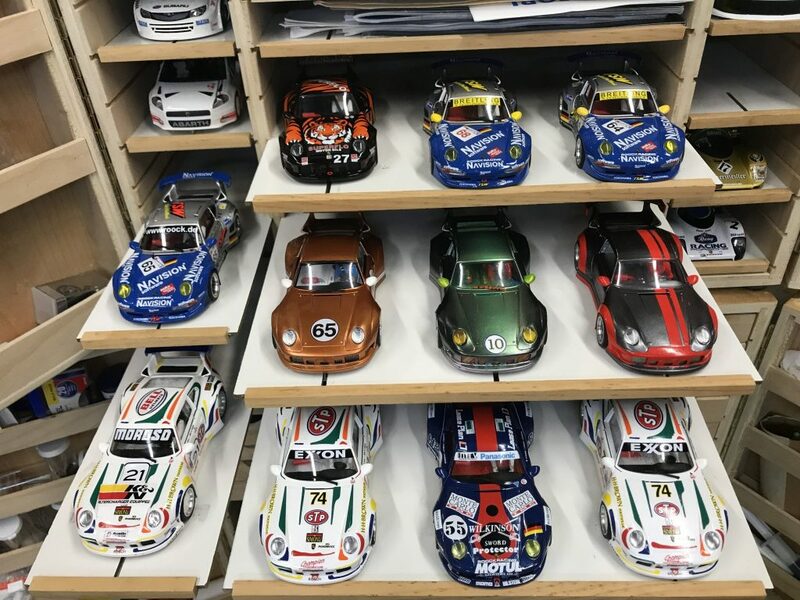 The other cool aspect of this series and any good spec series is the ability for any racer to win on any day. Small mistakes make a big difference in a spec series. This is not to say that the winner in any way lucked out. Quite the opposite, they were able to focus and limit their mistakes to the point they were able to run more laps. The big story for the races was how different the cars performed at this race versus the last race. The cars that were at the sharp end of the grid were having trouble getting close to their times from the previous race. Then there were cars that were not that fast at the first race that were absolutely flying at this race. Roy had set the pace in the last race with a super-fast time of 3.80 while he could not get below 3.95 at this race. The eventual winner, Steve, was flying and set the fast lap for this round with a time of 3.818. The other great thing was how quick the Group B racers were and how close they were to the Group A racers. Really fun to watch everyone running together. At the end of the day it was Steve winning with 225 laps. 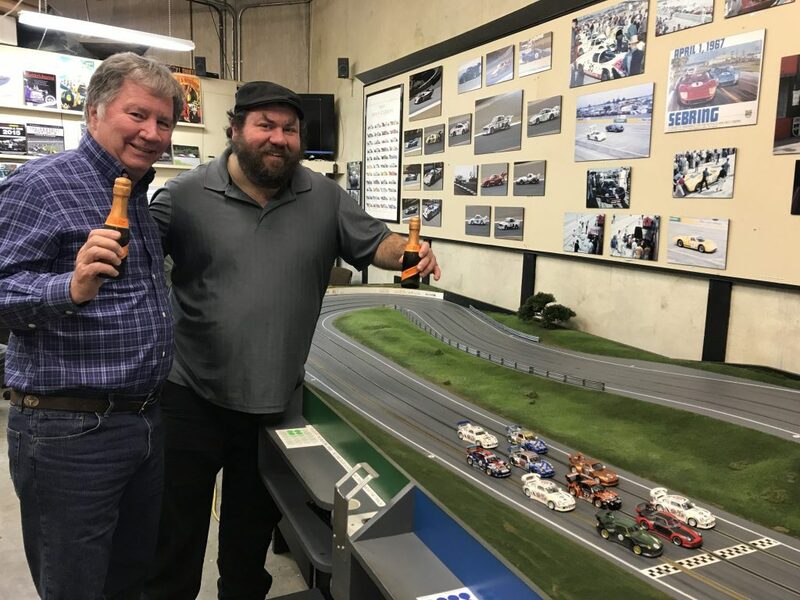 This is the first win for Steve in a long time and he was just as happy with the win as everyone else in the club was to see him take the victory. Steve was super consistent as well as being quick – a difficult mix. 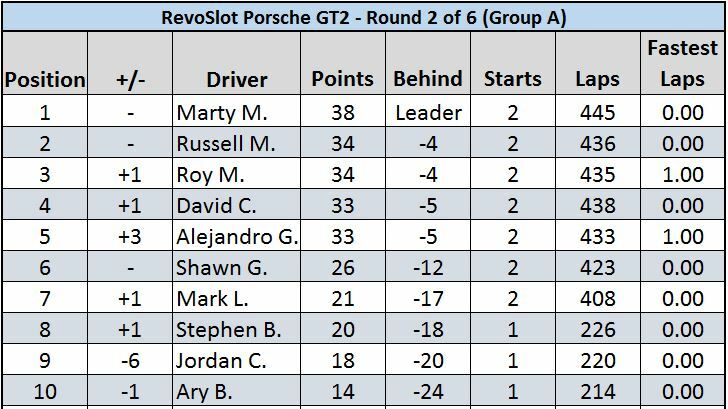 Alejandro was second with 223 laps and Marty finished out the podium with 222 laps. David finished fifth with 220 laps, Roy in sixth with 215 laps, Russell in seventh with 214 laps, Ary in eighth in a rental car with 213 laps. 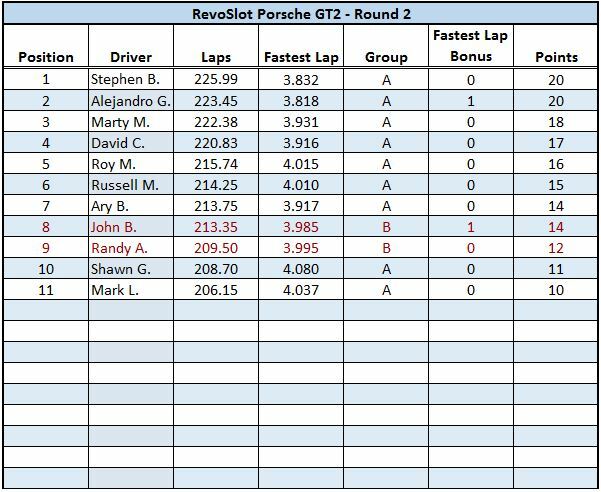 Group B racers were led by John with 213 laps, I believe his highest lap total since joining the club. Randy was the second place Group B racer with 209 laps. Perineal fast man Shawn was down in 10th spot with a car that was way down on power – more on this to come. Mark finished out the results in 11th spot with 206 laps. He had some quick laps but also had too many de-slots to finish any higher in the field. 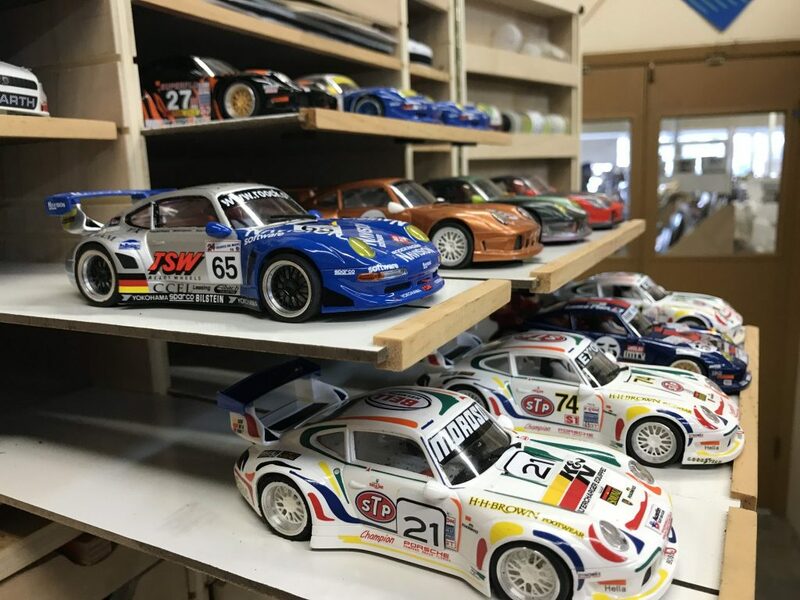 The cars were all rechecked at the post race tech to make sure they were all in compliance with the rules – especially those that finished on the podium. As mentioned earlier one of the big concerns was the lack of power we saw with three of the competitors. It was obvious that there was a motor issue with at least one of these three cars. Shawn’s car was more like a pylon on the straights and was passed by just about everyone. He was not losing as much time in the turns but could not keep pace on the straights. 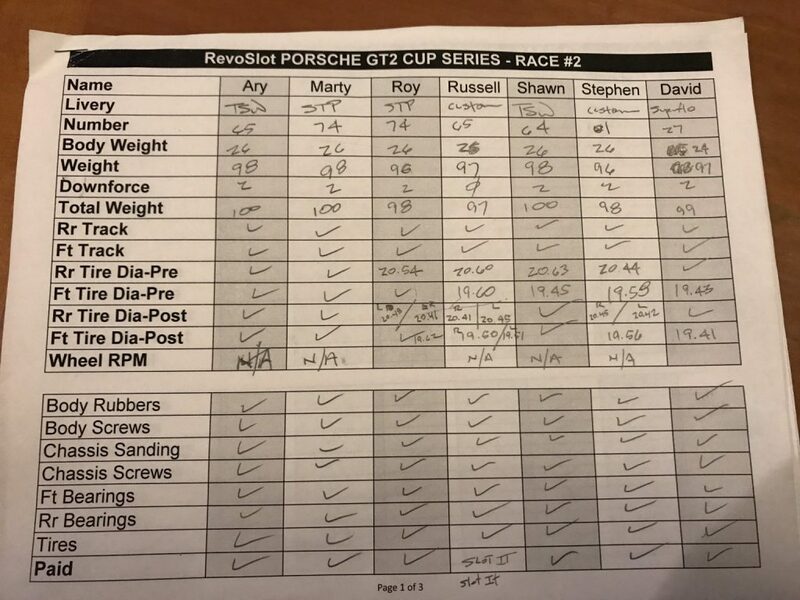 Roy and Russell’s cars are suspect for losing some pace due to the motor as both cars were slower on the straights than their competitors and what they showed in the previous round of the series. 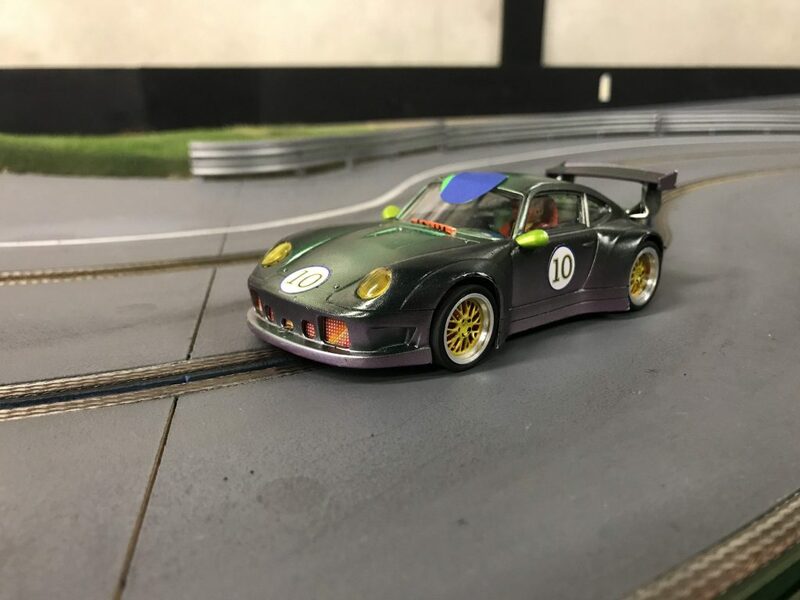 This race had one more racer than the last race but not the full number of racers we know that have purchased one of these cars. 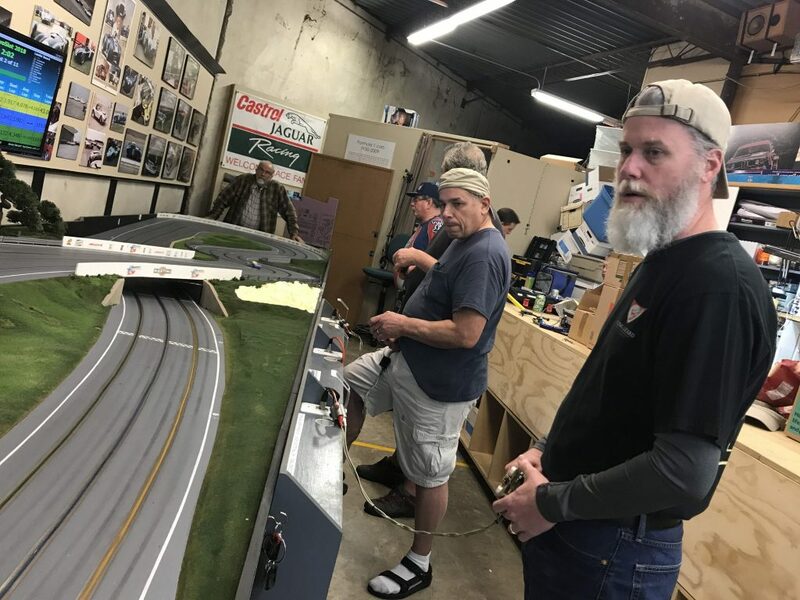 We are hoping more racers will come out and join us for the next four races. 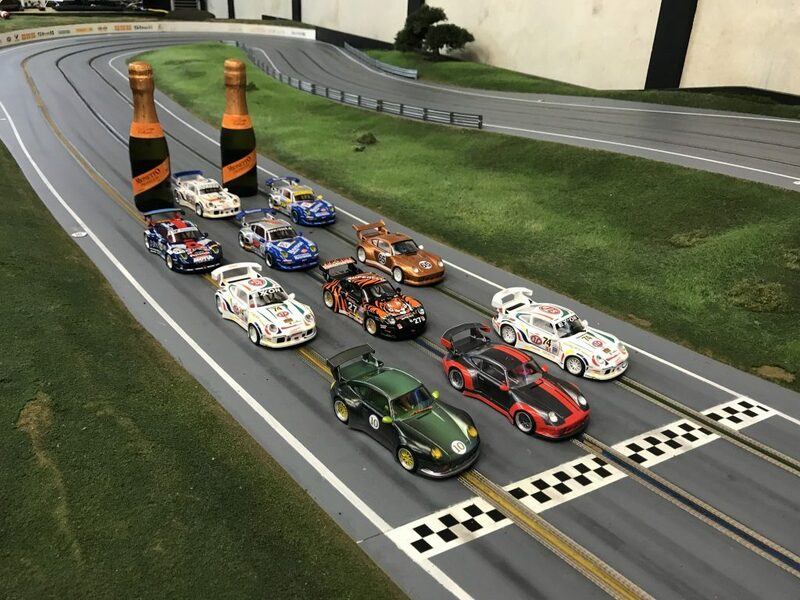 With 11 or 2 racers this series is tons of fun to drive and watch. I can’t wait to see what happens in the next round. Sorry for the delay in getting these results out. There was an issue with the RMS file and Steve had to go into Kings and pull the report and email it to me. 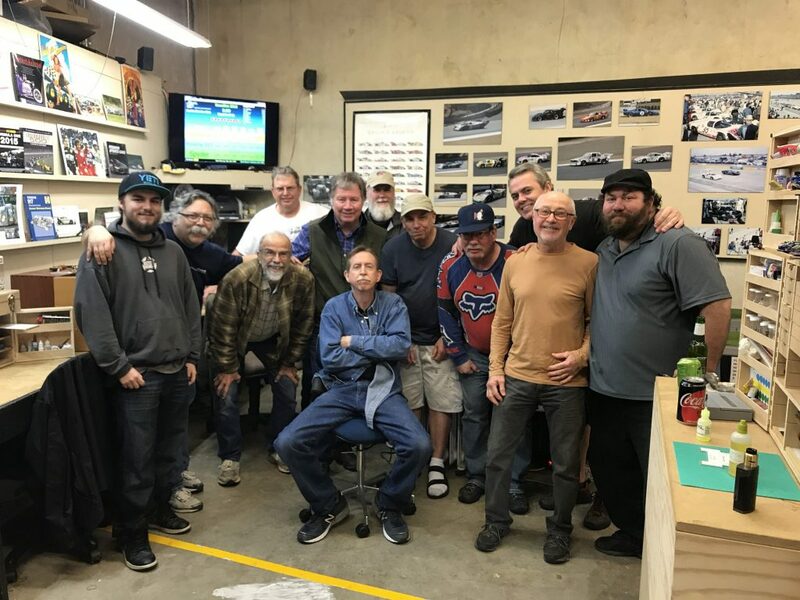 Your stories on both races so far are just outstanding! Great pictures. So much information. You have really set the bar high for race reporting. I agree, great story data and pix! 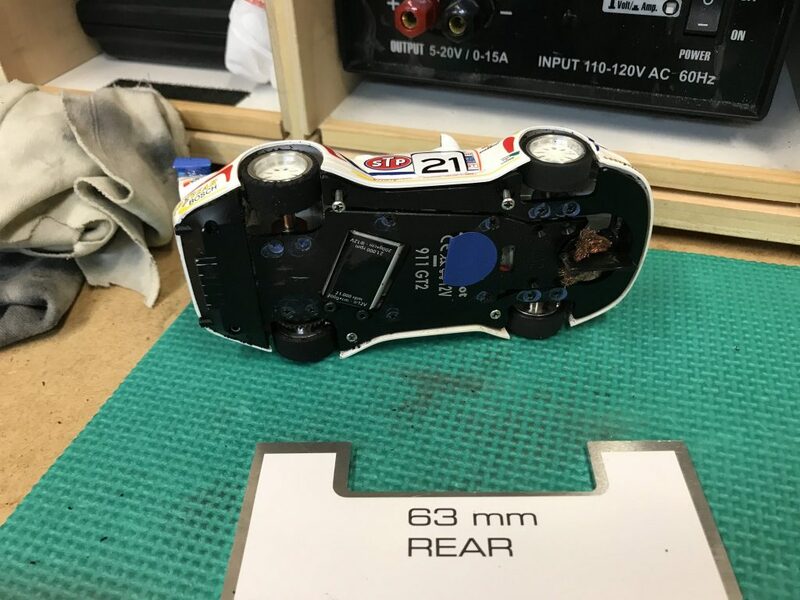 On the series forum discussion i wish to consider that in light of most tire wear appearing on the right, non driven side that the 1 to 2 gm heavier left (b/c of wgt of motor mount, pinion, and spur) gives more bite as compared to the lighter right. I would like to see longtitudinal wgt balance comparisons. I can experiment with my mule this thursday to see if 2gm added to the right side pod has any effect on evenous of wear. If not conclusive- the wear may be due to right hand torque which we cannot really compensate for.